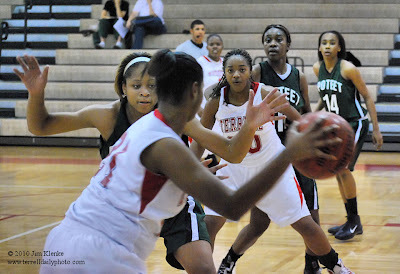 The Lady Tigers opened up District 15-4A with a loss to the Pirates from Mesquite Poteet 58-45. A slow second quarter doomed the Tigers when they were outscored 18-8. They played Poteet even in the second half and their inside game showed promise. Tonisha Dean led the Tigers with 16 points, the majority coming from inside or from the free throw line. The Pirates, who made it 3 games deep into the playoffs last year, were led by Shanovia Gamblins 31 points . The Tigers recored is 0-1 in District and 3-3 overall. The Lady Tigers will play two games on the road before returning home to play North Garland on Dec. 7th.